A couple of weekends ago LilMan, Em and I headed over to Grandma and Grandpa's house to pick blueberries; we picked over 30 cups worth! So the next question what to do with all of these? Naturally we'll freeze some for future use on pancakes, toppings and smoothies, use some right away in cobblers, pies, muffins and Jam! I have never canned before. Luckily, my mom is an expert; so she put aside a Friday to teach me. It was actually really easy - I was surprised! We made 4, yes 4, different Jams! The people at Kraft Foods were kind enough to send me some samples of their Sure-Jell Pectin to give a try during our Jam Day. 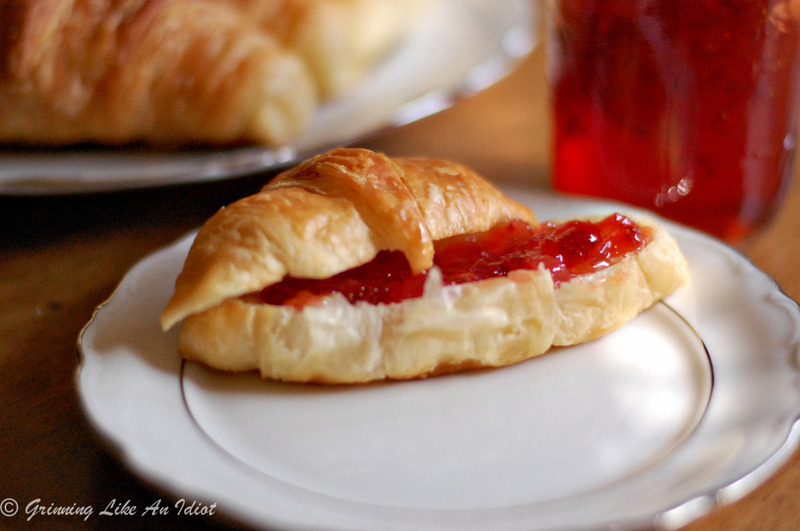 So, we started with a family recipe the Fresh Strawberry Jam and the results were mouthwatering!!! The night before, I prepped the kitchen (Mom was very specific on how she wanted it setup for an assembly line production). Jars, lids and rings were washed. I placed the water bath and the jar warmer on the back burners, the large pot on the front burner, more jars and lids in easy reach when we've filled the ones in the warming bath. 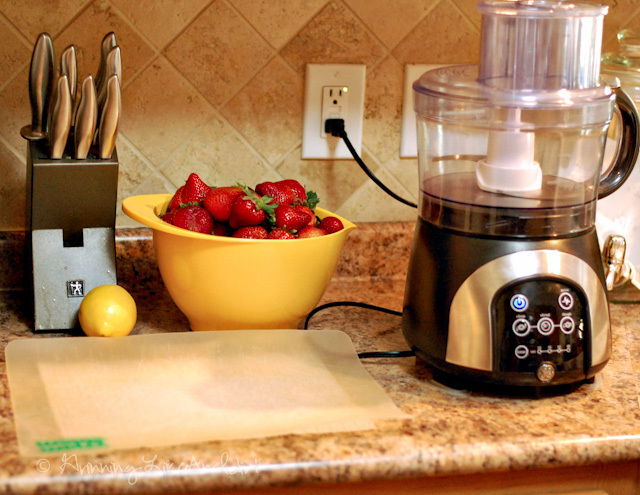 I set up a cutting and mixing station, and washed all the fruit and veggies (I did the cutting on Jam Day). We started with the Strawberry Jam. Aren't the strawberries gorgeous! Mom's Tip: the riper the strawberries, the sweeter the jam. Mom Tip: Add Distilled Vinegar to the Hot Water Bath (that's the really big pot), the amount doesn't matter, she literally dumped some in from a gallon jug. If I had to estimate it was about a 1/4 cup. 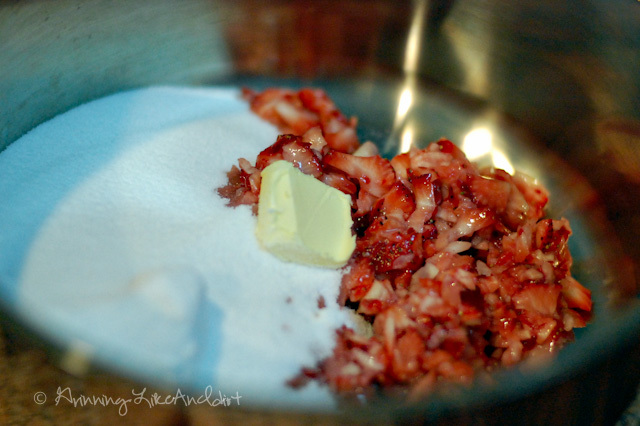 Then we added 5 cups of strawberries to the food processor and pulsed it until we had small chunks. Mom Tip: If you like big pieces of strawberry in your jam, don't chop them as fine because they will cook down. We added all the sugar, a tab of butter (aka tablespoon), a pinch of salt, then constantly stirred it over medium heat until sugar was melted and it broke into a rolling boil. Once the liquid got to a rolling boil, we turned down the heat a bit to keep a rolling boil without boiling over, then added the Sure-Jell Powder Pectin and waited for 1 minute while stirring constantly. Then turned off the stove and start the canning process. Mom Tip: Add in the tablespoon of butter to reduce the amount of foam (because we did this there wasn't a need to remove foam - there wasn't any foam to remove). The pinch of salt is something her mom told her to use to "bring out the flavor of fruits". Mom Tip: Place a wooden spoon over the top of the pot to prevent it from boiling over. 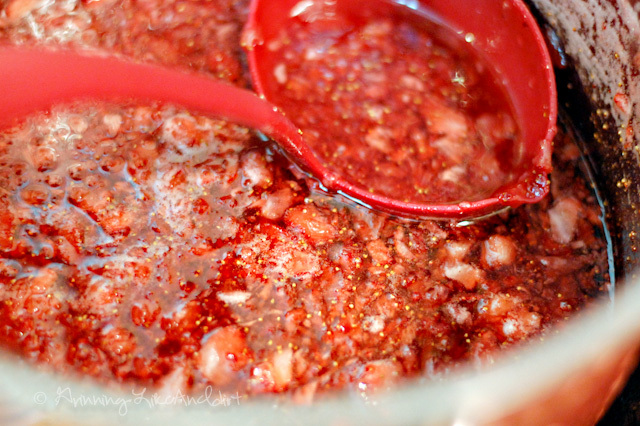 This is what our Strawberry Jam looked like when it was ready to ladle into the jars. Once the Jam was ready to can, we used team work allowing us to work very quickly. We put up 51 jars of jam in 5 hours (and that's with a nice lunch break and a run to the grocery store for more green tomatoes). Team Work!!! Mom lined up the warm jars and replaced the jars in the warming bath while I ladled the hot jam to about 1/4" from the top of the jars. I'd then remove the funnel place it on the next jar and ladle more. 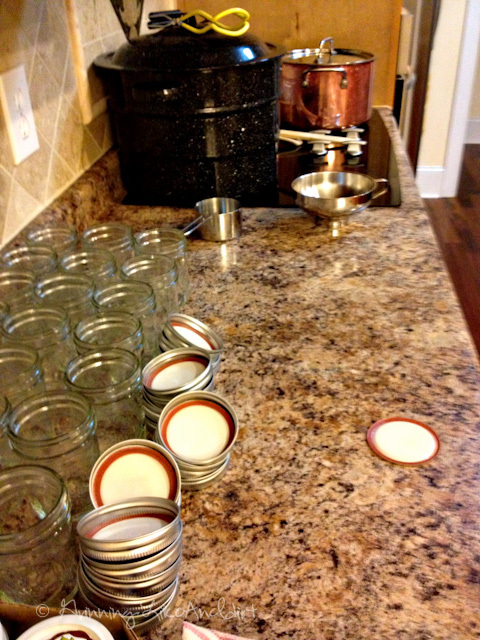 While I placed the filled jars to the side, Mom would wipe the rims, place the lids and tighten the rings, then put aside until we had 12 jars ready to go into the hot water bath. 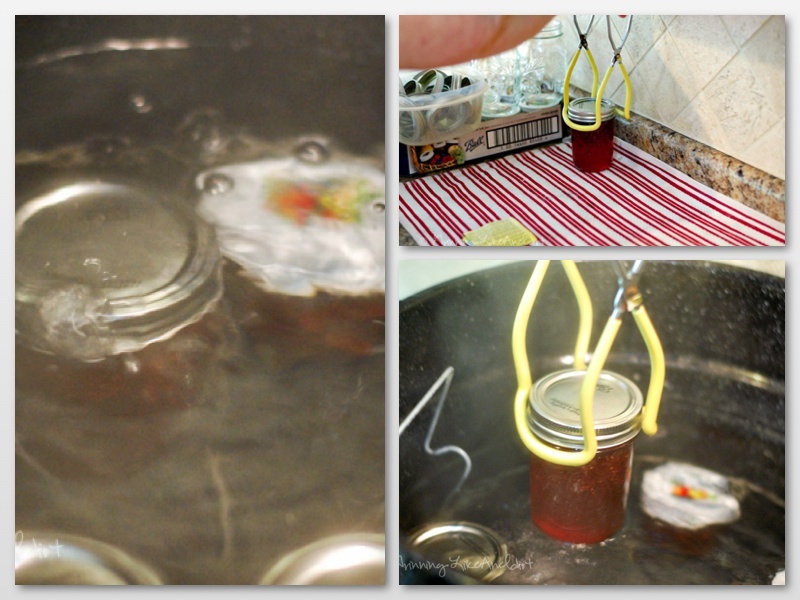 (Note: once the liquid is in the jars, the jars get really hot and you'll need to start using your canning tongs). Mom Tip: Wipe the rim with a damp paper towel, even if you didn't get anything on it. Once we had 12 jars, we placed all of them in the hot water bath. And left them covered in the boiling water, for 10 minutes. Note: You'll notice the jars are completely submersed under the hot water bath. Then we used the tongs to remove and place on a towel, and covered them with a towel. We let them sit under the towel until they cooled and began to setup up, at least 24 hours. Mom Tip: What you want to hear is a pop; it's the sound the metal lid makes when it is sucked inwards. Mom referred to that pop as a "happy sound". Mom Tip: If you don't hear the pop, to check if it is sealed, push on the top middle, if it pushes in it is not sealed. If it didn't seal the first time; remove the ring and the lid, wipe the rim clean again, place the lid and ring back on tightly and put back in the hot water bath for 10 minutes. We had two instances of this and they sealed the second time. We made the 4 different batches on a Friday and tasted them on Sunday. The strawberry is so unbelievably fantastic, it is 'slap your momma good!' :). Now that I know how to can or "put up", Mom and I are going to team up for more, and not just jam. What are some of your favorite canning recipes? Night before Prep: Clean strawberries. Run the jars, lids and rings through the dishwasher (use heat dry). Add about a 1/2" of water in the jar warming bath and to each of the jars. 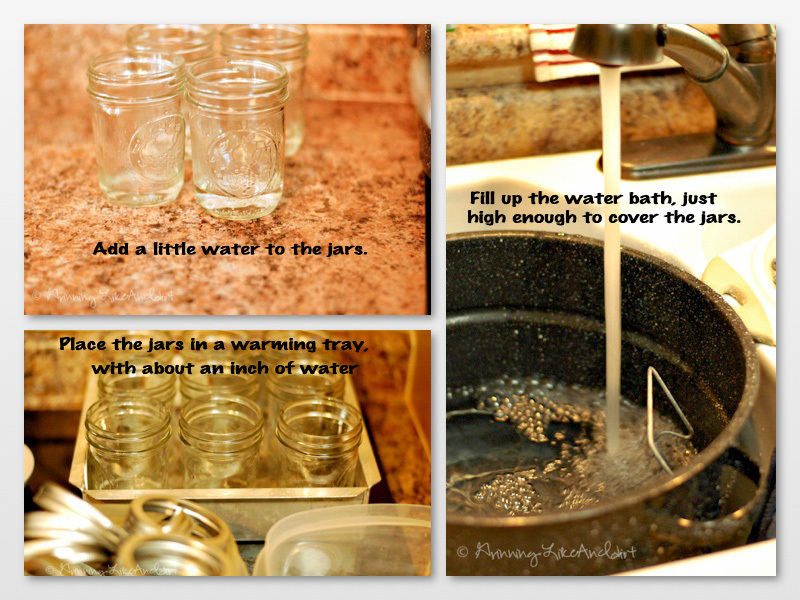 Place in the warming bath as many jars and lids you can. 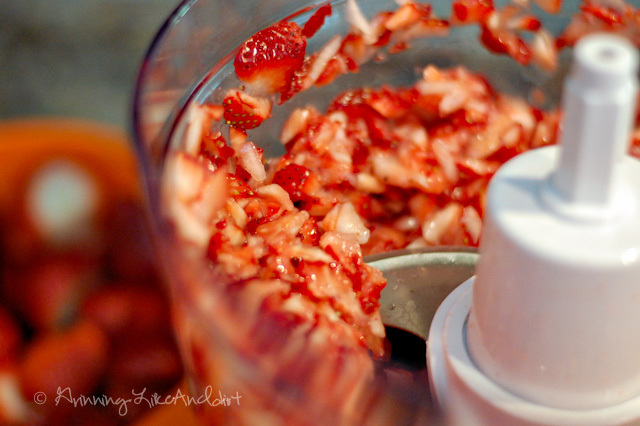 To make the Strawberry Jam: Add the strawberries to the food processor and pulse to chunky. 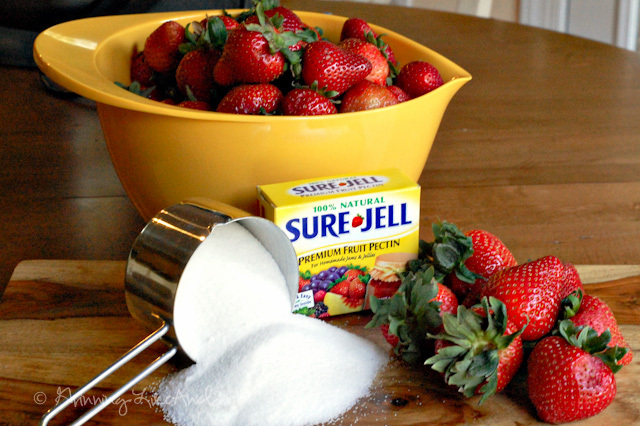 Measure 5 cups chunky strawberries into 6- or 8-quart saucepot. Add sugar and pinch of salt; stir. Add butter to reduce foaming. Bring to rolling boil (a boil that doesn't stop bubbling when stirred) on high heat, stirring constantly. Stir in pectin. Return the liquid to full rolling boil and boil exactly 1 minute, stirring constantly. Remove from heat. Ladle quickly into prepared jars, filling to within 1/4 inch of tops. Cover; bring water to gentle boil. Process 10 minutes. Kraft Foods is providing the products for this program review at no cost to me. This program is not administered or sponsored by Kraft Foods or its affiliates, but solely by Grinning Like An Idiot.